This article is from Academic Advising Today, Volume 34, Number 3, September 2011. It is an adapted version of an article which first appeared in De Observant (May 19th, 2011), Maastricht University’s weekly newsletter. One of the most important tasks of an academic advisor, according to Charlie Nutt, Executive Director of NACADA: the Global Community for Academic Advising, is to teach students appropriate strategies with regard to learning. “We need to focus more on student learning as opposed to helping students,” he says. Charlie is a charming, energetic, and seemingly tireless American with a true passion for acade mic advising and improving students’ college experience, and he recently spent four days in Maastricht on the invitation of Nicolai Manie and Oscar van den Wijngaard (both members of NACADA and academic advisors at University College Maastricht – see Oscar’s recent AAT contribution). Charlie gave several inspiring workshops, sharing his insights and strategies on increasing study success and improving student retention with the academic advisors and administrators of Maastricht University. In addition, he reserved time for individual meetings with the deans of the various departments. 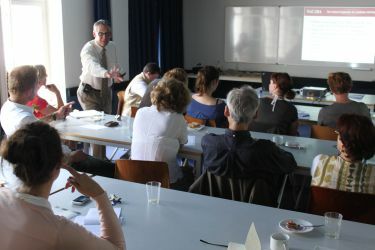 Academic advising is gradually gaining a stronger foothold at Maastricht University, reflecting a growing awareness of its importance for student success, and aided by a recent Dutch policy that can result in significant cost to both university and students when the allotted time to complete a study program is exceeded. At University College Maastricht (UCM), students can choose from more than 130 courses, with the guidance of academic advisors, and Charlie’s visit to Maastricht couldn’t have come at a better time, says Nicolai Manie, coordinator of UCM’s Academic Advising Office. “At the moment,” Nicolai explains, “UCM is re-evaluating its advising system, planning to make some significant changes to it.” Other faculties are also implementing new advising strategies this year: the psychology faculty introduced a new mentoring program, and the Department of Knowledge Engineering is piloting a faculty-based academic advising system for first year students, which most likely will be adopted by other departments of the university as well. With the development of new program structures, many important questions arise within Maastricht University’s academic advising community, such as what is the role of an academic advisor and in what way is it different from a study advisor? Charlie Nutt cautions that it is very important that each faculty defines these roles for themselves, making clear distinctions between the tasks of study and academic advisors. One word that is crucial to academic advising was heard repeatedly in Charlie’s workshops: connection. Making sure that the students can identify with their studies, that they can relate to the philosophy of the faculty and the university, is key for a pleasant and successful college experience. What is the most important factor for students during their studies, and what distinguishes students with a successful career from those who are less successful? The quality of teaching? Having a rich social life? Richard Light, a professor at the Harvard Graduate School of Education, conducted a survey with 1800 Harvard graduates and found the answer: the relationship with the academic advisor is the key to success. Or as Light put it (2001): Good advising may be the single most underestimated characteristic of a successful college experience (p.81). “Think about your own time as a student,” Charlie Nutt urges. “Perchance you met a professor who was truly inspiring and gave you guidance. But such an encounter should not be left to chance. We need to build a relationship between the students and the advisor before the students realize they need someone to help them out. Because once they realize they are in trouble, they’re already in so much trouble that they have difficulties getting out by themselves.” However, Charlie says, it is not the task of the academic staff to hold the students’ hands and solve all their problems for them. Rather, advisors should help students learn from their mistakes and “provide them with strategies and techniques to take success into their own hands, which is the student’s responsibility.” Advisors should help the students feel empowered. Light, Richard. (2001). Making the Most of College: Students Speak Their Minds. Massachusetts: Harvard University Press. This article has truly helped me think. There are some eye-opening statements that have pushed me to action. Fears of keeping up, prioritizing, and the lull of “am I the only one feeling ths way?” hunts my mind daily. The thought of giving up is somewhere at the top of my list. I must do what I know I need to do to remain abreast of these thoughts that continually cloud my mind. This article, and a few others, have motivated me to meditate on why I want this. If I feel this way, just think of the many students that I come in contact with daily. How they must feel. I need this, not only for me, but to encourage our student body.I need to help them in areas where I didn’t get help. My daughter is a junior at a very large university here in Texas. I copied and pasted portions of this article and sent to her. She has not mentioned to me of any encouraging assistance she may be receiving there on campus. A college mentor, or an advisor with her best interest at heart is needed to guide her. She graduated from high school 2010 and will have completed 70 credit hours at the end of this year (2011). She is self=motivated, unlike her mother. Her GPA is adequate. However, an effective counselor to check on her from time-to-time would be ideal. Other classmates appear to keep up. With my schedule, I must divide and juggle; trying to keep a balance is crucial. Thanks for the support !